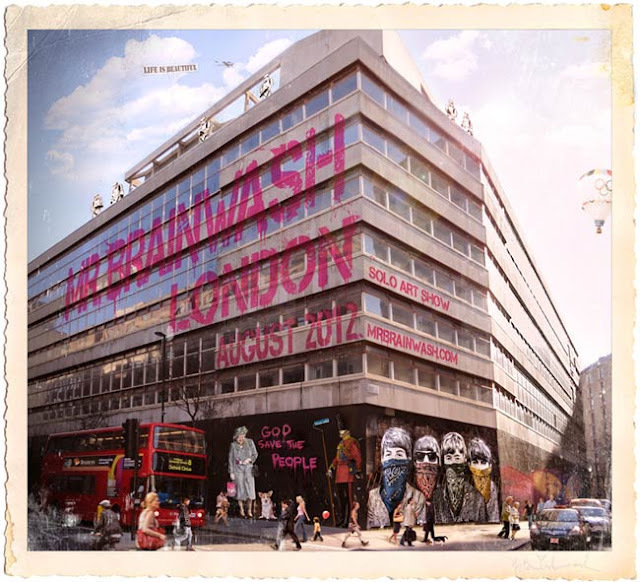 Mr Cliche, I mean Mr Brainwash, is hosting his first ever UK solo art show in London on August 5. This is during the London Olympics. I can't tell if this is to milk "Olympics" "London 2012" "Pippa's bum" keyword search hits, or whether it's to cash in on wealthy European art buyers who will flood the city during the British summer. The British summer is equivalent to the Australian winter in terms of rain and cold and shittyness. As you can see in this digitally altered image, MBW has used/borrowed/pilfered Banksy's use of British iconography - such as the Queen and the beefeater - while smothering it in bloggable irony, juxtaposition and satire. Would you see the Brainwash art show, or will you be too busy seeing non-nonymous people achieve incredible feats in stadiums?